Norn Minakami is a located in Minakami Town (Gunma Prefecture), within easy reach of the nearby expressway and train lines, making it an extremely convenient ski and snowboard resort to get to. In fact, you can easily for example spend a day taking in the sights of Tokyo (like Akakusa, Ameya-Yokocho and Tokyo Skytree near Ueno), and then spend the next day enjoy playing in the snow at Norn. Using the Joetsu Shinkansen you can be playing in the snow within two hours of leaving Tokyo! Norn is a relatively compact resort with two quad lifts and two pair lifts, and popular for it's park, Snowland for children and floodlit nighta - which is open until midnight on Saturdays in the peak season. 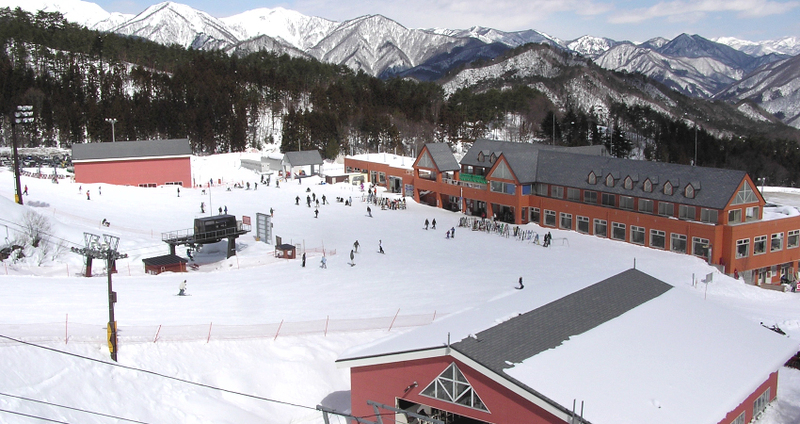 Norn Minakami Snow Land is a special area that is separate from the main ski and snowboard courses of the main Norn Minakami resort – a place where everyone, from children to adults, can enjoy and play in the snow in safety. The area features a number of special attractions. 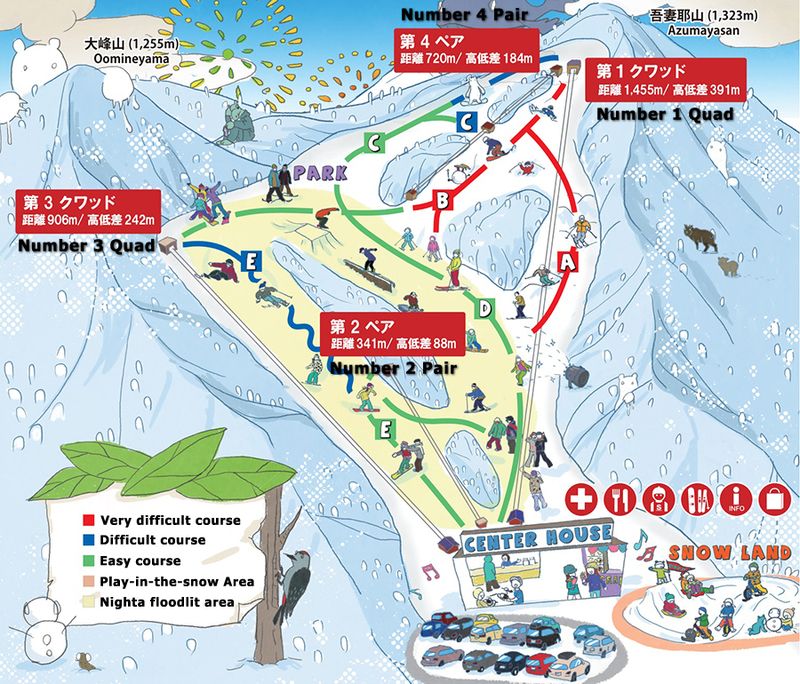 The Main Area of Snow Land is located at the base of the resort by the Number 2 car park. It is a place where young children can enjoy playing in the snow in safety. A 40m long moving walkway gives easy access to the attractions. Entry is 1000 yen per person. On the weekends, the ‘Sub Area’ is open and can be got to by shuttle bus. This Sub Area is a large area for playing in the snow with scoops, snowball making kits and other fun things to play with. There’s also things for older children and young families as well, offering a different way to enjoy the winter snow. A family of four can ride the mobile banana boat and a parent and child can try the buggy ride experience, so there is a lot that a young family to enjoy. If things get a bit too cold, you can sit by the warm stove in the resting area and enjoy some light snacks. This area is open on weekends and national holidays, but can also be reserved for private use on weekdays. Norn can respond to various requests, such as pick up and lodging, as well as special events (for example snowball fights, snow shoeing and treasure hunting games). 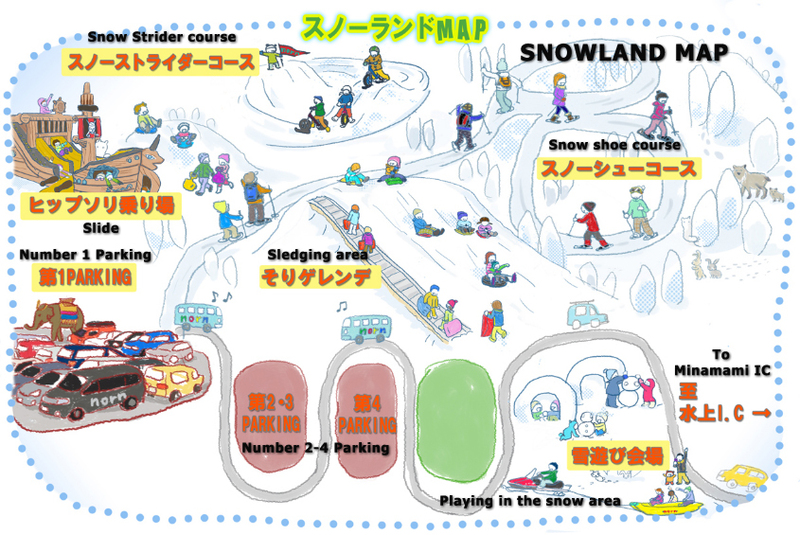 So please come and enjoy your – or your families – ‘playing in the snow debut’ at Norn Minakami Snowland this winter. You’re sure to have a lot of fun! Entry Charge 1,000 yen per person. Snowball fight experience: from 1,500 yen per person. Please ask for details regarding numbers of people and schedule. Treasure Hunt: 500 yen, using GPS and beacons – find treasure in the snow forest! Please ask for details regarding numbers of people and schedule. Please note that the playing in the snow area is open on weekends and holidays. • After paying the entry fee, entry to the Snow Land areas is free (on showing the wristband). Sled/sledge rental is free, though there are some special sledges that incur a rental charge. • Please show your wristband to staff on re-entering. • Please note that the wristband becomes invalid when taken off. • The wristband is valid for the day of use and cannot be re-issued and there are no refunds. • The wristbands are non-transferable and can only be used by one person. • Please do not use any equipment with sharp edges. • Please do not use plastic skis or plastic boards. • Any personal belongings are brought into the area at owner’s risk. • Please do not over-speed, always keep control and avoid any obstacles and other people. • Please stay on the course areas and do not stop in places that will interfere with other people. • Please do not sledge in areas other than the specific sledging areas as it is dangerous. • Please return any rental items back to the original place after finishing using them. • People not following the instructions of the staff will be asked to leave. • We are not responsible for any accidents or injuries due to falls or contacts with other people within Snow Land. • Please use snowshoes inside Snowland as indicated by the information. Boots MERREL boots can be rented at the reception/entrance to Snow Land. The rental charge is 1,000 yen per day. Senior tickets are for people 55 years of age and over. Weekday Season Ticket valid daytimes and nighta on weekdays (except January 1st, 2nd,3rd). Early Nighta Season Ticket valid can also be used for a 5 hour daytime ticket or early ticket. Please note that gloves, goggles and knit hats are not available to rent. These items can however be bought at the shop at Norn Minakami. The shop sells gloves, goggles and hats as well as a wide range of other ski and snowboard related goods and wear. Minakami town is famous throughout Japan for being a popular onsen hot spring resort town. A wide choice of onsen hot springs and accommodation can be found just 10 minutes from Norn Minakami. Norn Minakami is just 20 minutes from Minakami Station on the Joetsu-sen local train line. A free shuttle bus operates between Minakami Station and Norn Minakami. The resort is also just 20 minutes from Jomo Kogen Station on the Joetsu Shinkansen train line that runs direct from Tokyo Station and Ueno Station. A free shuttle bus from Jomo Kogen is also available at 8:10am and 9:40am (reservations required). You can be at Norn Minakami less than 2 hours from leaving Tokyo Station! Norn Minakami is located just 3km (and 5 minutes) from the Minakami IC exit of the Kanetsu Expressway.